This groundbreaking book examines a concept that has gone unexamined for too long: The concept of “job fit” in the student affairs profession. Fit is a term used by nearly everyone in student affairs throughout the hiring process, from search committees and hiring managers to supervisors and HR professionals. This book opens a conversation about the use of “job fit” as a tool for exclusion that needs to be critically investigated from multiple standpoints. This edited collection brings together a number of voices to look at the issues involved through various lenses to explore the ways policies, procedures, environments, and cultural norms provide inequitable job search experiences for individuals from various marginalized groups. These include looking at the legal aspects, employer definitions, communication barriers, as well as scholarly personal narratives looking at the concept from the perspective of class, race, gender and sexual orientation. Emerging from the Commission for Social Justice of ACPA, the personal narratives and critical explorations in this book are an attempt to provide graduate students and professionals with a resource that is relevant to the job search in an increasingly competitive job market, while taking into account the complex realities of their identities. The normative assumptions of “fit” are analyzed by the authors to make visible the barriers those assumptions create for those with non-dominant identities. The student affairs profession strives for inclusion and acceptance as a core value, and an essential competency. The profession has made progress in the way it serves students, but there is a disconnect between the conversation about students and the way those same values play out in the treatment of practitioners and scholars in the field. This book aims to help job seekers looking to evaluate fit in their current and possible future positions, as well as hiring managers who face challenges in creating equitable hiring processes. Challenging the norms and rhetoric about job fit in student affairs means that scholars and practitioners alike must be able to incorporate this topic explicitly into various aspects of the profession. "Debunking the Myth of Job Fit in Higher Education and Student Affairs unapologetically critiques the myth of the importance of 'Job Fit' in higher education and student affairs, offering a clear, honest, and challenging picture of the biases faced by minoritized professionals during the job search process and once they are employed at Predominantly White Institutions. The authors of this book comprehensively address the various excuses that colleges and universities claim have kept them from achieving the inclusivity and equity advocated in their mission statements. Simultaneously, the authors offer specific, cutting edge – yet doable – recommendations for creating environments that enable minoritized individuals to be their authentic selves, thrive, and succeed in welcoming higher education settings." "This is a must read text for every person in a hiring position or on a search committee. Each chapter is a robust blending of critical theoretical perspectives and scholarly personal narratives that results in an interrogation of job fit, which for many is a taken-for-granted good. Taken as a whole, the book illuminates how fit serves to limit job opportunities for some and reinforces structures of inequality, while also providing vital guidance to those making hiring decisions." 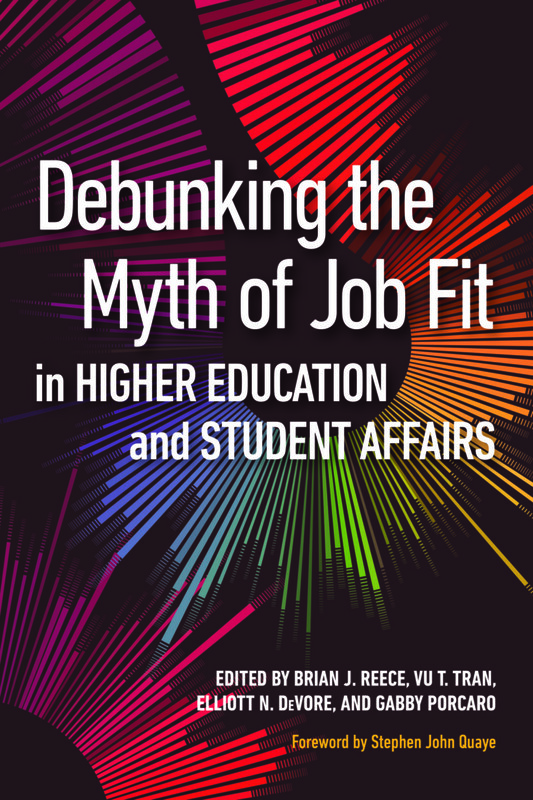 "Debunking the Myth of Job Fit in Higher Education and Student Affairs is a must read for anyone involved in hiring staff at any level. This book engages the very present dynamic of 'code' words that maintain the status quo and support a culture of exclusion. Bravo…"
Brian J. Reece is the Associate Director of Residential Life at Colgate University in Hamilton, NY, where he also serves on the institution’s Diversity, Equity, and Inclusion Task Force. Previously, he was the Associate Director of the Toppel Career Center and Lecturer in Mental Health Counseling in the Department of Educational & Psychology Studies at the University of Miami in Coral Gables, FL. Brian has spent six years on the Directorate Body of the ACPA Commission for Social Justice Educators, where he co-founded the CSJE Blog and recently became Chair-Elect. He is also a reviewer for the Journal of Critical Scholarship in Higher Education and Student Affairs. Vu T. Tran currently serves as an Assistant Director of Residence Education at Michigan State University. As a graduate of The Ohio State University’s Higher Education and Student Affairs PhD program, Vu’s research focuses qualitatively on issues of age and adult identity, adultism, and social justice education in the context of colleges and universities. He has been involved in various forms of social justice education work throughout his career, including the Asian American Cultural Center at the University of Connecticut, the Program on Intergroup Relations at the University of Michigan, and the Next Step Social Justice Retreat at the University of Vermont. He has also been involved in numerous capacities with the Social Justice Training Institute, as well as ACPA’s Commission for Social Justice Educators. Elliott N. DeVore is a PhD Student in the Department of Psychology at the University of Tennessee, studying Counseling Psychology. After completing his MEd in Student Affairs and a Graduate Certificate in Social Justice in Higher Education at Iowa State University he worked as a Residence Director at the University of San Francisco where he also conducted workshops with the Gender and Sexuality and Intercultural Centers and campus ministry, advised the Queer Student Alliance, and taught a course on peer assistance and education. Gabby Porcaro is currently serving as the inaugural Coordinator for LGBTQ Programs in the Intercultural Center at Roger Williams University. Prior to this role, Gabby served as the Student Affairs Case Manager, the Bystander Intervention program coordinator, the interim Safe Zone program coordinator, and as an Instructor for the first-year academic success program at the University of North Carolina at Asheville in Asheville, NC. Gabby has presented on topics such as the evolution of hate in society, the intersection of faith and queer identities, the effects of race and gender on economic stratification, supporting LGBTQIA communities on college campuses, and communicating across lines of difference.